Published: March 20, 2019 at 05:12 p.m.
Scouts and coaches of NFL teams gather in Columbus, Ohio. to see the best Ohio State football has to offer. Dwayne Haskins showed off his arm with throws to Paris Campbell and other receivers, as Mike Weber, Demetrius Knox, and others ran drills. With nearly a month away until the 2019 NFL draft, take a look at some of the best moments of the 2019 Ohio State Pro Day. 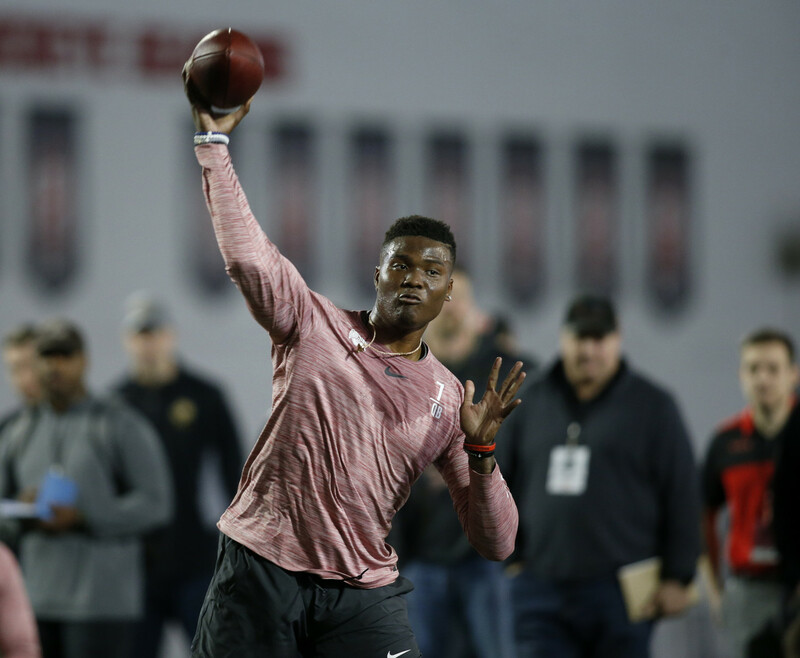 Ohio State quarterback Dwayne Haskins passes during NFL Pro Day at Ohio State University in Columbus, Ohio, Wednesday, March 20, 2019. Ohio State quarterback Dwayne Haskins, left, talks with wide receiver Terry McLaurin during NFL Pro Day at Ohio State University in Columbus, Ohio, Wednesday, March 20, 2019. Ohio State offensive lineman Isaiah Prince runs through a drill during NFL Pro Day at Ohio State University in Columbus, Ohio, Wednesday, March 20, 2019. Ohio State offensive lineman Michael Jordan runs through a drill during NFL Pro Day at Ohio State University in Columbus, Ohio, Wednesday, March 20, 2019. Ohio State offensive lineman Demetrius Knox, right, runs through a drill during NFL Pro Day at Ohio State University in Columbus, Ohio, Wednesday, March 20, 2019. Ohio State wide receiver Johnnie Dixon makes a catch during NFL Pro Day at Ohio State University in Columbus, Ohio, Wednesday, March 20, 2019. Ohio State wide receiver Paris Campbell makes a catch during NFL Pro Day at Ohio State University in Columbus, Ohio, Wednesday, March 20, 2019. Air Force wide receiver Jalen Robinette makes a catch during an NFL Pro Day at Ohio State University in Columbus, Ohio, Wednesday, March 20, 2019. Ohio State running back Mike Weber runs through a drill during NFL Pro Day at Ohio State University in Columbus, Ohio, Wednesday, March 20, 2019. Ohio State defensive lineman Dremont Jones runs a drill during NFL Pro Day at Ohio State University in Columbus, Ohio, Wednesday, March 20, 2019. Ohio Dominican wide receiver Cory Contini makes a catch during NFL Pro Day at Ohio State University in Columbus, Ohio, Wednesday, March 20, 2019. Ohio State kicker Sean Nuernberger kicks during NFL Pro Day at Ohio State University in Columbus, Ohio, Wednesday, March 20, 2019.